A new Warner Brothers studio promises more DC superhero games like Arkham Asylum and fewer like, well, most other superhero games. While there have been a few exceptions, it's really hard to make a good superhero game. Think about it: In any given superhero story, how many characters are actually stronger than the protagonist? Superman could snap Lex Luthor like a twig; Batman could beat the Joker into a pulp. Remove the characters' moral restraints and put them into an interactive, combat-based setting, and an archetypal battle of good vs. evil becomes a massacre. In spite of these challenges, new studio Warner Brothers Montreal believes that the time of the rushed, buggy superhero games is drawing to a close. The studio, which is working on various DC Comics properties, hopes to make more games in the style of Arkham Asylum by tapping into a rich superhero mythology instead of a movie release date. Warner Bros. Montreal came into existence recently with a "mandate" straight from the film studio itself to make good games. While a Looney Tunes game is not out of the question, the main focus for now is on the Warner Bros. DC Comics license. 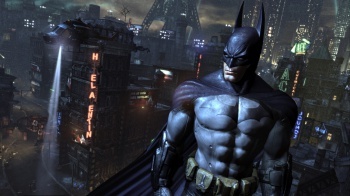 Martin Carrier and Reid Schneider, the studio's vice president and executive producer, respectively, believe that Rocksteady's Batman: Arkham Asylum raised the bar for what is now acceptable in a superhero game. "They changed people's perceptions and that's why we're not satisfied anymore with sub-par superhero games," says Carrier. Schneider agrees, citing Spider-Man for the PS1 as another example of a superhero game that succeeded by crafting a brand new story that respects the source material without adapting a specific comic book or movie story. "It's not about hitting the movie date or some arbitrary date-it was giving the game the time it needs to be successful and really just concentrating on the quality of it," he says. Much like Blade or X-Men made the superhero film a legitimate genre, Schneider believes that Arkham Asylum did the same thing for superhero games. According to Schneider, it's no longer acceptable to simply put out a bad - or even mediocre - movie tie-in game. "Those days where publishers could do stuff like that and make money from it, it's just not the same ... [Only] the really high-quality games with mass market appeal are making money. That whole middle layer, where there were movie games or cash-ins-that market is gone." While it's true that movie tie-in games rarely make the same kind of money as a Gears of War or an Uncharted, they also cost much less and have much shorter development cycles. Superhero movie games don't have to be big hits, or even very good, in order to be profitable. However, with DC's biggest properties in the hands of a studio using Arkham Asylum as a template, there's a very real chance for a superhero games to shine. Ten years ago, superhero movies went from being schlocky disasters to one of the most popular genres in the medium. Ten years from now, will the same be true of superhero games?